This makes a wonderful picnic dish when stuffed into pittas, but if I were serving it at home, I would pile it up on a plate and turn it into something altogether more special. Preheat the oven to 140°C/gas 1. Cut the tomatoes in half along their 'belly' and place on a roasting tray, skin-side down. Scatter with the sugar and 1 crushed garlic clove; season and drizzle over 1 tbsp olive oil. Cook for 1 hour 30 minutes or until the tomatoes are dried but still juicy. Meanwhile, make the pesto (try to do this as late as possible before serving; the pesto tends to discolour, though the flavour is not affected by this). Put the pistachios in a blender and process until fine. Add the remaining pesto ingredients and blend again. Taste and adjust the seasoning. Debone the mackerel fillets. Rub with the remaining 1 tbsp olive oil and season well. Heat a ridged griddle pan or barbecue and cook the fish skin-side down for 4–5 minutes until cooked through. Grill the pittas for 1–2 minutes, then place each on a serving plate. Mix the Greek yogurt with the remaining crushed garlic and spoon it over, then top generously with the pesto. 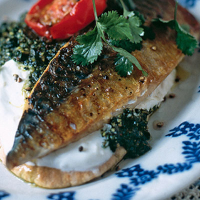 Place a mackerel fillet and a tomato half on each pitta. Scatter over some mint and parsley and serve with the lime wedges. Alternatively, just stuff everything inside the pitta for a picnic. Authentically dry vinho verde is light enough to quaff but also has enough vivacity to cut the mackerel’s richness.